Staple Island trip. Sailing around all of the Farne Islands viewing the birds and seals and landing on Staple Island, a National Trust Bird Sanctuary for 1 hour. Total trip duration is 2.5 hours. 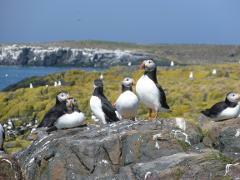 All Day Birdwatch Trip - sailing around all the Farne Islands as well as making a landing on Staple Island for two hours in the morning and landing on Inner Farne for two hours in the Afternoon. Total duration, approximately 5.5 hours. 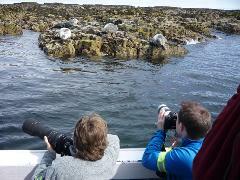 A Grey Seal Cruise spending 1.5 hours sailing around the Farne Islands and spending time viewing the Grey Seals and bird life at several vantage points. 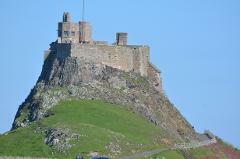 This trip views the seals at the Farne Islands then sails to Holy Island with beautiful coastal castle views. A two hour landing at Holy Island/Lindisfarne. Total duration of trip is 4 hours. 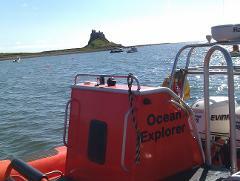 A high speed trip to Holy Island onboard. 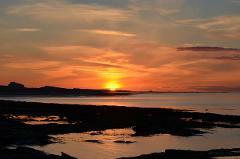 We view the seals at the Farne Islands then sail to Holy Island with beautiful coastal castle views. A two hour landing at Holy Island/Lindisfarne. Total duration of trip is 4 hours. A 4 hour pelagic trip out at sea, offering an excellent opportunity to view our offshore birds and larger mammals. A leisurely sunset cruise around the islands viewing the wildlife, including scenic views of our beautiful coastline and Bamburgh Castle, with the occasional visit from our local dolphins.